Although no introduction is necessary, these words draw the reader into Artscroll's recent biography (May 2014) by Rabbi Yehuda Heimowitz, which chronicles Rav Ovadia's life and achievements. While I have some familiarity with Ashkenazi rabbis and the chain of tradition passed down through them, I sorely lacked any idea of the rich Sephardic heritage and the scholars and righteous men who upheld and disseminated Judaism, often under dire circumstances. Although sometimes not directly about Harav Ovadia, it is an important part of the book. During Harav Ovadia's first year at Chief Rabbi of Tel Aviv, the head of the city's kashrut department asked Harav to sign off on the Hilchot Pesach that the Tel Aviv Rabbanut published each year. Harav Ovadia told the man that one line needed to be changed before he could sign it: "Rice and beans are prohibited, and the Sephardim have a custom to eat them." Harav said the correct phrasing should be "Rice and beans are halachically permissible, but the Ahskenazim have accepted upon themselves a stringency not to eat them." The head of the kashrut department protested that the text had been that way for years. He was also a little nervous because Rav Isser Yehuda Unterman, the Ashkenazi Chief Rabbi of Tel Aviv, has authored the document. Rav Unterman said that Harav Ovadia was correct, and the document was changed. Rav Mordechai Toledano recalls that when his family moved to Haifa after his appointment to the Rabbanut beit din, his father-in-law Harav Ovadia exhorted him to establish as many shiurei Torah as possible, not to suffice with serving on the beit din nd learning for his own sake. When it became known in Haifa that Rav Toledano was willing to deliver shiurim upon public request, invitations started streaming in from the entire city. Once, he was invited to speak at a particular school, and only after accepting the invitation did he learn that the school was co-ed. He felt uncomfortable delivering a shiur in that type of environment, but he was also loath to renege on his commitment, so he called his father-in-law for advice. 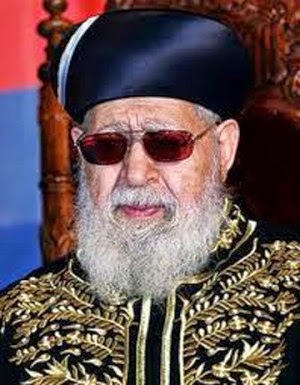 "He felt that to bring Torah to the masses, you had to be like the sun, which does not differentiate between the various peoples of the world; it shines for everyone. So, too, I would have to get used to the idea of delivering shiurim to all sorts of audiences if I was to have an effect on the masses." Overall, I learned a great deal, and my admiration for Rabbi Ovadia has grown now that I know "the whole story." But no book is perfect. The text is 564 pages, and the final chapter or epilogue is a little too whimsical to end a book about a Torah giant. There is a glossary, but some of the words in the text, like meishiv, are not included in the glossary. Other phrases, like atzeret teshuva, are defined literally, but the significance of a "repentance gathering" is omitted. With non-fiction, it is always helpful to include a timeline and short biographies of key personalities mentioned in the book. While there are many photographs, some from personal collections, maps would have been an added bonus, as would an index for a book of this length. In some ways the book reminded of The Hare with Amber Eyes. Why? Because even when I wasn't interested in the intricate details, it was evident that the author put a lot of time and effort into gathering the vignettes and organizing the wealth of information he collected. Finally, while details of many of Harav Ovadia's personal challenges were included, some of the less than glowing stories were omitted. How did Harav Ovadia react when former Chief Ashkenazi Rabbi Goren (with whom he disagreed on many issues) died? How did Harav Ovadia react when his protege, Aryeh Deri, was sent to jail for accepting bribes? These sound like questions asked because "inquiring minds want to know," but many biographies paint our Torah giants as so great that the average person could never aspire to come anywhere near that greatness. Seeing the more human side of these luminaries helps the rest of us know there is hope. Harav Ovadia's funeral is mentioned -- 850,000 people jammed the streets of Jerusalem to pay their respects. While it is amazing how many people, from all walks of life, felt compelled to be there, the magnitude of this event should be put in perspective: Israel has about 8 million citizens, which means about 10 percent of the total population of the country showed up. If 10 percent of the American population showed up for a funeral, that would mean about 34 million people would be in attendance!! Another testament to the greatness of Harav Ovadia. In a related story, hasgacha pratis (Divine Providence) made itself obvious in the course of my reading. I had to renew the American passports for some family members, and they came back with our last name spelled wrong, which meant I had to go back to the American Consulate and get them fixed. As long as I was in Jerusalem, I decided to do some other errands. I ended up by the Sanhedria cemetery, and I did not know why there was so much activity. It turns out that day was the one year yarzheit (anniversary of the death) of Harav Ovadia (3 Cheshvan, which fell on October 27th this year). I got to pray in the cemetery (I could not get close to the grave), and I picked up some items for my son, who is a big fan.